The past is often appealing. Going back to the good ol’ days or the way things used to be is something we all long for at some point. We can spend so much time reminiscing or thinking about memories. We can loose track of time wrapped up in special or funny memories. We can also spend a lot of time with regrets. As humans we have a tendency to long to go back in the past and fix our mistakes. If we could just have another chance we would get it right. It seems like it would be a good thing if we had the ability to go back. The kangaroo is an interesting animal. God gave them the ability to hop very fast. 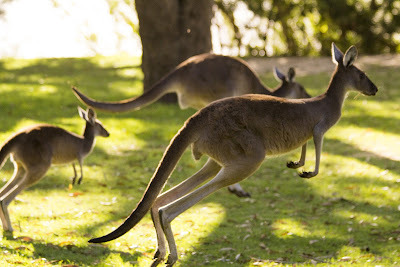 Kangaroos can hop comfortably at about 12-15 miles per hour (19-24 km/h). Humans have to run to go that fast. Kangaroos can go as fast as 44 miles per hour (71 km/h)! No human has ever run that fast! God gave kangaroos an amazing forward speed, but he did not give them the ability to hop backwards. Because of the shape of their legs they are unable to go backwards. God gave us the ability to move forward in time. However, we are unable to go backwards in time. God knew it would be better this way. He wants us to forgive others and ourselves for mistakes we have made and move forward. He does not want us to get stuck wishing we could change the past. Isaiah 43:18 encourages us to let the past stay in the past. It is good to learn from the past. But we should not constantly remember it or consider it. Instead we should focus on the present and future. What event from the past do you wish you could change? Do you have burdens or scars from the past you wish could go away?